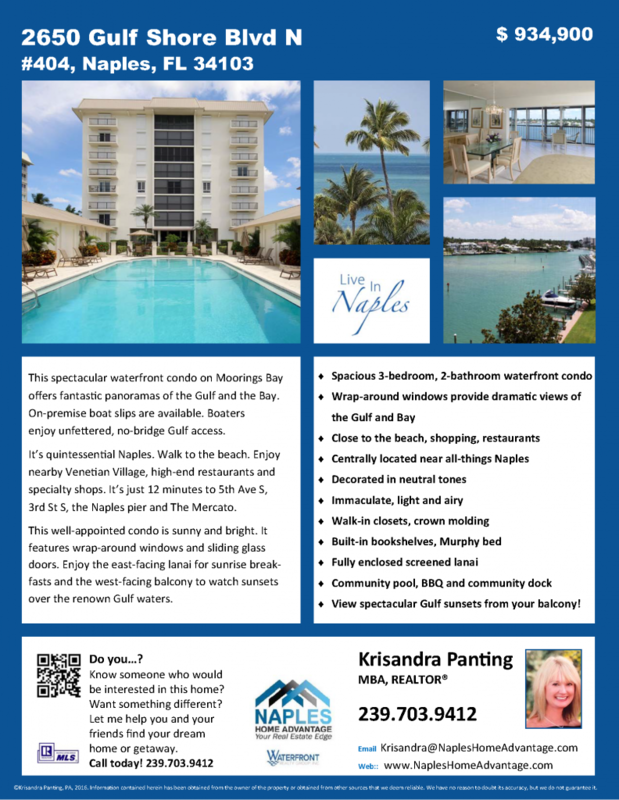 For Sale – Knock-out Naples Condo on Gulf Shore North! Your Gulf Shore condo awaits you, with expansive views of the beach and gulf from your home at 2650 Gulf Shore Blvd N, #404, Naples 34103. This is a must-see by appointment only, as this exclusive building does not allow Open Houses! You are a few steps from the pool, the beach or the building’s dock, and close to shopping and restaurants. Bright and airy, this luxury condo is priced right so it won’t be on the market for long, so make sure you check it out soon. Contact Krisandra Panting, MBA, REALTOR® now. Call 239.703.9412! Have a question about this condo or another home in Naples? Give Krisandra a call now at 239.703.9412 or send me a message.